​Originally used for the brutal sport of dog fighting, the Perro de Presa Canario remains a forceful guard dog. Today it is primarily kept to protect people and their property as well as kept as a companion. The Perro de Presa Canario originated from the Canary Islands, located off the coast of northern Africa. They are descended from the Bardino Majorero, a multi-purpose farm dog native to the islands. Often the ancestry of the Canario is simplified by stating that they are a mix of English Mastiffs and old style Bulldogs crossed with the Bardino Majorero. In reality, no one knows for sure how many breeds were used in its development. The Bardino Majorero would have been altered in stages. The first occurrence when Spanish mastiffs arrived with Conquistadors and colonists passing through ports on their way to the New World. This influx would have occurred as early as the 15th century. It would not be until the English came in the 16th century that their own breeds contributed to the bloodline. Primarily by the aforementioned Mastiff and Bulldog. By then the Bardino Majorero was near extinction and what had replaced it was a breed known for its abilities in bullbaiting and dog fighting. When dog fighting was outlawed in 1940 Canario’s numbers declined rapidly, although fights continued illegally in some areas of the islands. This continuation did the breed no favors as further imports diluted the bloodlines. Breedings became lax in the desire to have the best fighter. 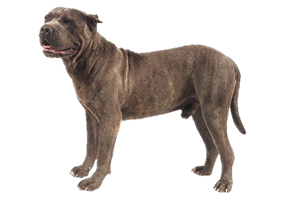 It is believed several breeds, such as the Neapolitan Mastiff were added at this time. On another front, those not participating in the illegal fights were replacing the Canario with imported breeds like the German Shepherd. This drove the number of pure specimens down even further. Numbers reached their lowest point in the 1950s and 1960s, but luck turned on the Canario’s side when Spanish rare breed enthusiasts rediscovered the breed. Having a mastiff native to the islands renewed interests toward the Canario and a few remaining examples were found on outlying homesteads working as guards and farm dogs. This stock were used to create a slow, but established breeding program. Today the Perro de Presa Canario remains rare, but stable. Is the Perro de Presa Canario Right for You?